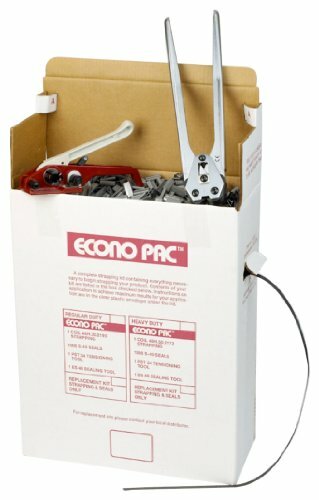 This PAC Strapping EP48HD strapping kit comes with 7,200' of heavy duty 1/2" wide strapping for palletizing and bundling items. The strapping is made of polypropylene and steel for dimensional stability, resistance to most chemicals, and strength. The kit also contains a heavy duty tensioning tool for tightening the strap, a sealing tool, and 1,000 1/2" open seals. This strapping kit comes packaged in a double-walled, self-dispensing carton. PAC Strapping Products manufactures plastic and steel strapping, strapping machines, tools, and accessories. The company, founded in 1982, is headquartered in Exton, PA.